In 2017, according to Statista.com, 65 million Americans went jogging or running during the prior 12 months (accessed April 27, 2018). This is up from 45 million ten years prior. Running has been popular in the US ever since Jim Fixx published The Complete Book of Running in 1977, which turned out to be a bestseller. • May 6, 1954: Roger Bannister breaks the 4-minute barrier in the mile. • June 27, 1965: Jim Ryan sets the high school mile-run record (time: 3:55.3). This record stands for 36 years until Alan Webb breaks it on May 27, 2001 (time: 3:53.43). • August 1984: Joan Benoit (now Joan Benoit Samuelson), then 26, won the first women's Olympic marathon. Also, running on a treadmill burns about 10% fewer calories than running outdoors on flat asphalt. This observation was attributed to how much a person ran, not dietary factors (Hartung GH, et al. 1980). Other studies support this. In middle-aged men, beneficial effects on blood lipids were seen in men who ran 7-14 miles per week but less dramatic effects were seen in men who ran less than that (Kokkinos PF, et al. 1995). • Effects on Blood Pressure: Data were obtained from over 9000 runners for the National Runners' Health Study. There was a clear link between blood pressure and distance run. Systolic BP declined steadily as distance run increased from 25 km/wk to 100 km/wk (Williams PT. 1997). • Effects on Knees: It is commonly believed that running damages knees. However, the opposite is actually more accurate. Running stimulates the meniscus to grow thicker, thus providing the knee joint with more cushioning. 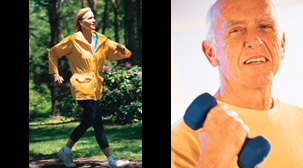 • Effects on Bone Strength: It is well-known that weight-bearing exercise strengthens bone. Interestingly, the amount of weight, or resistance, doesn't have to be extreme to obtain benefit. However, in premenopausal women who exercise to the point that they develop amenorrhea, bone density declines, often to a point similar to a post-menopausal woman. This topic is discussed in detail in "Female Athlete Triad" (coming soon). • Shoes: Buy the best you can afford. Train in them before running the actual race. • Clothes: Be smart: wear Coolmax or nylon, not cotton. If it's cool when the race starts but the weatherman predicts warm weather, plan to discard a layer at some point during the race. 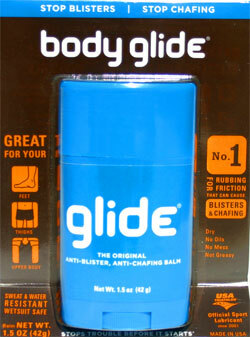 • Rub It On: Consider BodyGlide. Face it, 4 hours of chafing can do some damage. Don't forget sunblock. This topic is covered more thoroughly in other stories (see Articles), so it will only be discussed briefly here. • Carbohydrates: For runners and other endurance athletes (cyclists, swimmers, triathletes, cross-country skiers, etc. ), it is important to take in enough carbohydrate to replenish glycogen both during and after a strenuous run. After 60 minutes of hard aerobic exercise, your glycogen stores are severely depleted. Further, it takes at least 24 hours to replenish these muscle glycogen stores. Some research has shown that adding protein to carbohydrate supplements does help to replenish muscle protein stores after heavy weight-training. But, for endurance athletes, the addition of protein offers very little compared to supplementing carbohydrates by themselves. • Fat: The diet of most Americans contains plenty, if not excessive, amounts of fat. Generally, you don't need to increase the amount of fat in your diet. The topic of supplementing protein immediately (eg., within 30 minutes) after strenuous exercise has received a lot of attention. Some research does show that recovery is enhanced with sports drinks that combine carbs with protein compared to carbs-only drinks. Some recommend protein consumption of 0.3 g/kg in the ensuing 24 hours post-race. Regarding specific types of amino acids, such as branched-chain amino acids, this topic is covered in greater detail in the review "Dietary Protein and Exercise". In their book The Performance Zone, John Ivy, PhD and Robert Portman, PhD use the label "30W15" to describe how much and when to consume these nutrients: beginning 30 minutes before exercise and ending 15 minutes after exercise ends. They recommend consumption of both carbs and protein during this entire time frame. In the past, many in sports medicine believed that athletes competing in lengthy races or events should "drink as much as possible" during and immediately after the event. This was encouraged to prevent dehydration. Today, that is no longer recommended due to the very real risk of developing hyponatremia, a condition where the sodium concentration in the bloodstream is diluted too much. In 2002 and 2003, respectively, the International Medical Marathon Directors Association (IMMDA) and USA Track & Field issued guidelines for fluid intake during exercise. In general, athletes should consume no more than 800 ml per hour, though, sweat rates (and, therefore, fluid intake requirements) differ from person to person. Surprisingly, some elite marathoners consume only 400 ml of fluid per hour during a race....some, even less than that. And these elite racers rarely develop serious dehydration. Obviously, other details like weather conditions, exercise intensity, a person's body weight, etc., factor into how much fluid a runner should consume during a prolonged event. Douglas J. Casa, PhD, ATC, FACSM, at the U. Connecticut has devised a formula for calculating your sweat rate. Knowing your personal sweat rate can help you better determine how much fluid to drink during a lengthy exercise session. This topic is covered in detail in a separate story "Fluids and Electrolytes During Exercise". Also, some excellent information on this topic can be found at USA Track & Field: "Training Library - Hydration". • The world's "longest" run appears to have been done by Istvan Sipos of Hungary who logged 12,526 miles in 263 days. • In October 2005, Dean Karnazes ran 350 miles non-stop in northern California (source: Runner's World magazine, February 1, 2006). The longest nonstop run ever recorded by a woman was 301 miles over a period of 79 hours and 57 minutes in March 2005 by Pam Reed. That's the equivalent of more than 11 marathons. • In 1989, Rae Clark set a record for a 100-mile race at 12 hours, 12 minutes, and 19 seconds. • The record for most miles run in a 24-hr period is 188 by Yiannis Kouros of Greece. • Patrick Fitzgerald ran a total of 610 miles in a 6-day "Go As You Please" event held on an indoor track at Madison Square Garden. In the same event, Charles Rowell ran 353 miles over a period of 72 hours, stopping only because he accidentally drank some vinegar and it upset his stomach. This event was held in -- are you ready? -- 1884! • Major William Maples has run California's Badwater Ultramarathon 6 times. In 2004, he couldn't compete due to his deployment to Iraq. So, he mapped-out a 10.4-mile loop around camp and completed the 135 miles in 37 hours and 59 minutes, stopping only once, when enemy rockets landed nearby. • For Rick Worley, 57, (Kingwood, TX), the Houston marathon in January 2005 was his 300th marathon. Even more impressive is his stretch of running 200 of those marathons over 159 consecutive weekends. 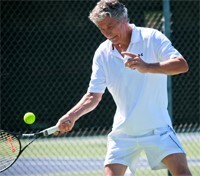 • Ernie Van Leeuwen (Encino, CA) ran the Los Angeles marathon at age 91. Edith Farias (Washingtonville, NY) began running marathons at age 60. She is now 80 and has completed 26 marathons. • Alan Robinson (Chicago, IL) was feared to be a quadriplegic following a car crash in 1990. He has now completed 2 marathons. He ran them. • In 2004, Sarah Reinertsen, 29, became the first female with a prosthetic leg to enter the Hawaii Ironman. Chuck Bryant, 47, (Miami, FL) lost his leg in a motorcycle crash in 1983. He has since completed marathons in all 50 states and Washington DC. After reading these accounts, it makes you wonder what you could accomplish, doesn't it? • Training: The longer the race, the longer your training program should be. For example, if you've never run a marathon before, a 4-5-week training program won't be enough time to get you prepared properly. Find the right combination of aerobic training and resistance training. Don't underestimate the importance of rest for proper recovery and to avoid injuries. • Prepare mentally: Study the course (where are the hills?). Don't start too fast. Listen to music. Think positive. • Fluids and Electrolytes: Don't make the mistake of drinking too much water and taking in too little sodium. Make sure you have figured out your hydration "formula" well before race day. • Carbs: Any time you exercise for longer than 60 minutes, your body will be in a serious glycogen deficit. Plan to ingest small amounts of rapidly-absorbed carbs (sucrose, glucose) every 20-30 minutes. Whatever you choose, try it on a training run so that you know it won't give you stomach cramps. Road Runners Club of America: www.rrca.org. USA Track and Field offers a lot of information and tools for runners. 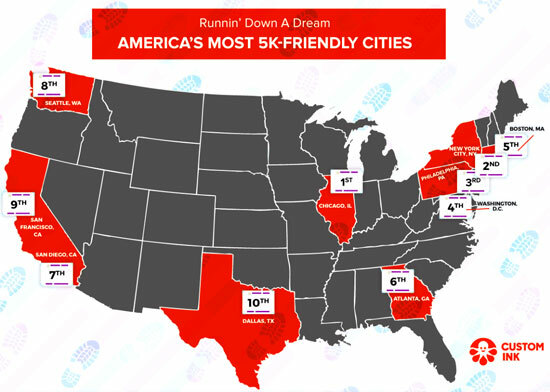 At www.USATF.org/routes you can search a database of nearly 600,000 routes to run! Team In Training (www.TeamInTraining.org) is the largest endurance sports training program in the world. The program provides training to run or walk a whole or half marathon or participate in a triathlon or century (100-mile) bike ride. • "Fluids and Electrolytes During Exercise": Get the sweaty truth on how much fluid you should (or should not) be drinking during a marathon. • "Running Shoes": Don't underestimate how important your shoes are during a long race. This review will tell you how to get the right shoe for your foot anatomy.